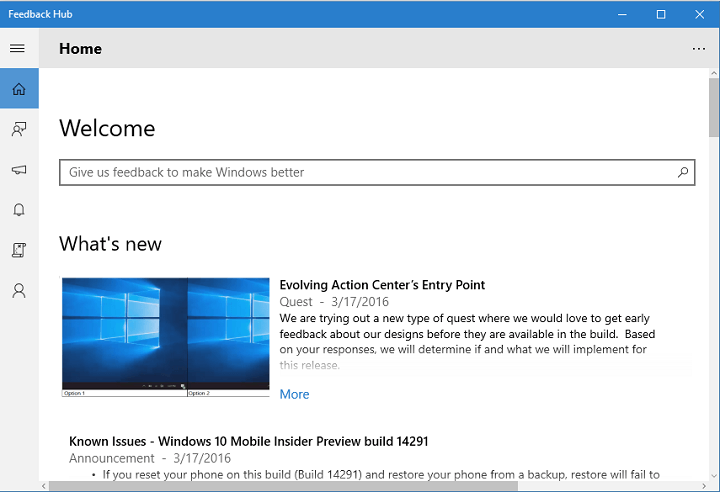 Just like Microsoft announced last week, both the Feedback app and Insider Hub have been merged into the Feedback Hub, available to Insiders in the latest build for Windows 10 Preview as of yesterday. As Microsoft mentioned, the new app will contain the best features from both of the previous apps, making it easier for users to use just one app to submit feedback instead of two. The new app looks similar as previous two apps with only a couple of new features and some user interface changes. First, there’s a search bar that appears right after you open the app so you can easily search feedback from others. Also, Announcements and Quests are now shown together within a “What’s new” section. So, all the information about the latest build for Windows 10 Preview, as well as additional info, can be found in this section. Microsoft also improved the option for sending feedback, as well, giving users the option of adding more details when submitting feedback in order to give Microsoft more valuable information. This will come in handy, especially if we consider that every Windows 10 Preview build comes with issues that no doubt bother users. Microsoft is constantly pointing out that feedback provided by Insiders is crucial for the development team to deliver a quality operating system. It might even feel like Microsoft is pushing users too hard to provide feedback, with a lot of people disliking that approach. One tactic the company used was making it impossible for Insiders to turn off the Feedback feature, having forced some people to leave Insider Program. Some users are also concerned about their privacy in Windows 10 because the OS collects user data in order to give Microsoft information about how Windows 10 performs on people’s computers. We’re sure that Microsoft’s intentions are good as the company just wants to deliver a quality product and satisfy users. But giving users a little bit more freedom won’t hurt, either, because people who don’t want to submit feedback to Microsoft won’t submit it anyway. What do you think about providing feedback to Microsoft? Are you doing it on a regular basis? Do you like the latest Feedback Hub app? Tell us in the comment section below!